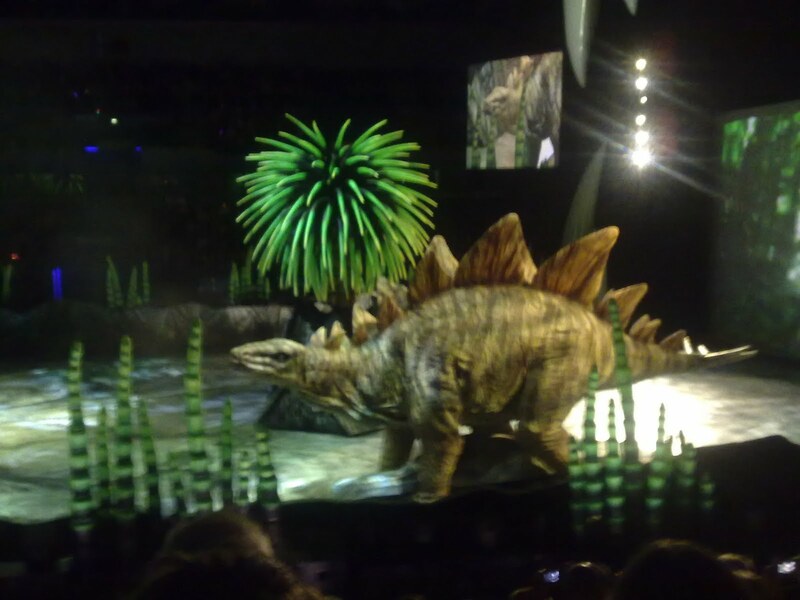 Two titans went up against each other in a desperate battle for supremacy this week, at the Walking With Dinosaurs show in the Echo Arena. Yes, amid earth-shaking, smoke machines and screaming children, I pitted an iPhone 3Gs and a Nokia N97 against each other to see which came out top. We also forgot to charge our phones before we went in – the Nokia had 3 bars left, the iPhone a quarter charge showing. I think the iPhone won that – it’s much crisper and has handled the low light better – and I think the zoom function compromised the N97 focus. The N97 image is sharper but the iPhone definitely makes better use of the available light. The Allosaurus is barely visible in the Nokia image. I think the N97 took the better shot although perhaps I was lucky that Mama Rex and tot stopped moving for a nanosecond as I shot this one. Both the Nokia and iPhone images look much sharper when viewed smaller, it’s only when they are used larger that they start to degrade. In terms of video I was really impressed with the iPhone; the sound and image quality is good. The N97 was capturing action on the far side of the stage, and picked up in terms of clarity when it shifted nearer my seat, but I still thought it would beat the iPhone, and I don’t think it did, on comparable settings. If I’d adjusted the set-up it probably would have performed better but – using it as a news-gathering tool, you’re not always going to have the luxury of time to do that. Of course, a Flip would have blown both iPhone and Nokia away in this test, but you couldn’t exactly use it to then mobile upload your videos. Or ring the story through to your newsdesk. On sundries, the N97 battery lasted about 20 minutes longer than the iPhone. Sound quality on all the videos we took came out better on the N97, but I suspect that was because it’s so easy to accidentally muffle the Apple microphone with your hand when you’re recording. So which phone won, in my view? Reader, I went out the very next day and bought… an N86. I'm loving this Alison, what a nice twist to add on a public event.